My best friend, Nesa, got engaged with the ever gorgeous Parvina on last Sunday, 11 March 2012. I knew I had to attend & be part of the groom's entourage! So I booked all my flights & cleared my schedule to be in Penang for this milestone! It was held at a local Hindu temple & it was mighty grand! 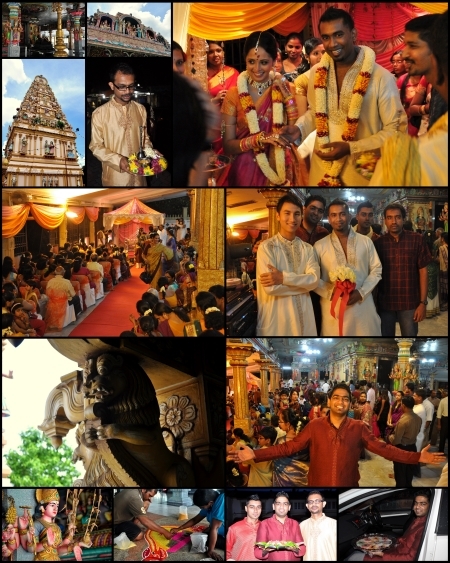 It was my first Indian engagement so I was pretty overwhelmed at the scale of it. Friends & relatives from all over came to the ceremony. The temple was packed & it was noisy with the sound of grumpy children & chatty adults; kinda like a pasar malam. When the groom arrived, he was accompanied by his family & entourage. The ladies in the groom's entourage carried platters with beautifully arranged desserts & fruits. The men were not allowed to handle them lest they be ridiculed as unmanly. In the temple, the groom waited while his parents met the bride's parents before the bridal tent. There the priest facilitated negotiations between the families. When all was agreed, the groom's parents presented the bride a saree & gold. Then, the bride excused herself to put on the saree & jewellery as a sign of acceptance. The groom was not involved in any of this. After the bride was ready, the groom was summoned. Then, they exchanged rings. After that, they prayed & asked for blessings at the altar. What followed were photographs after photographs after photographs. Diren & I were pretty tired & absolutely starving by then so we moved on to the buffet. 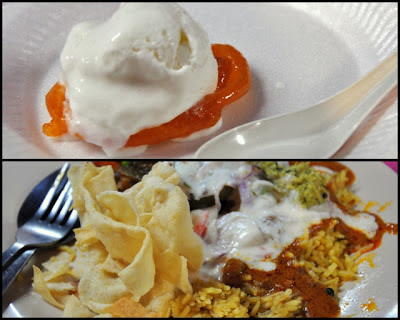 It was a vegetarian buffet catered from Sri Ananda Bahwan Restaurant: the best Indian restaurant in town! The vegetarian food was awesome! There were meat imitations of chicken & mutton curry. There were also servers making freshly made tosai & my favourite of the night, Jalebi + Vanilla Ice Cream. Oh, the cold ice cream went well with the warm freshly fried Jalebi. The ice cream was soft while the Jalebi was crispy. It was nothing short of oh some! I had 3 servings. The next morning, they registered their marriage all dressed up! This was my first marriage registration so it was an eye opener for the future when I myself would be sitting in those chairs. First, they made an appointment with a registrar. When everybody had arrived & both sides were seated in front of the registrar, he had to make sure that this marriage was mutually accepted. He asked several questions to the bride & groom. When he was satisfied that nobody was forced into this marriage, he instructed the groom to sign the documents first; followed by the bride. Then, the groom's father & the bride's father. Before the registrar signed the marriage documents, he gave a talk to the couple about being married, having children & their duty towards the greater Indian community. Later on, they prayed at the altar & received blessings from both sides of the family. 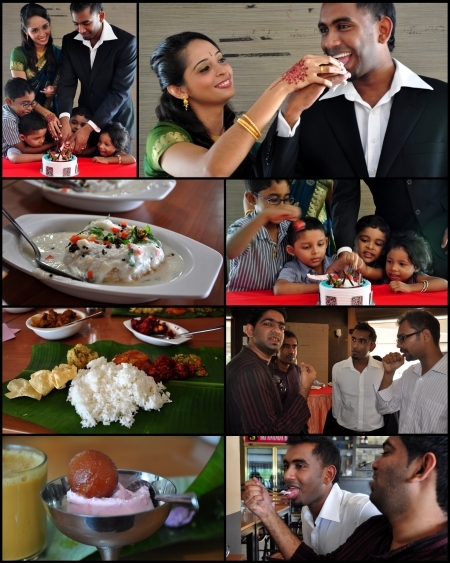 Later on we headed to Sri Ananda Bahwan to have lunch & celebrate the joyous occasion. That was when I had my first Dahi Vada (Indian spice donut in Indian yoghurt). It tasted very rich. Like a Tosai with extra yoghurt on top. It was not my cup of tea but it was worth a try. Very rare flavour. Remembering the Ice Cream Jelibe from the night before, I wondered about ice cream with my favourite Indian dessert, the Gulab Jamun. I gave it a go but I found that the Jelibe was better with ice cream because it was warm & crispy. Ice cream complemented it perfectly. Sadly, ice cream did not add much to the Gulab which was cold & soft like the ice cream. I had a great experience in Penang & the best part was I got to spend time with great people. You got yourself a great woman there. She gorgeous, smart &, best of all, she doesn't stand between you & I. Oh yeah! My Photo Migration Is Complete!